When I first tuned in on this morning news, I thought, "wow, finally, some entertainment." It was slightly amusing for a week or so... But we have to face it, these news reporters (if one can even call them that) have WAY TOO MUCH "playing around" time. At first, I thought Jillian was a breathe of fresh air. But seriously, this woman has got not the least bit of journalist in her. She is very unprofessional. She keeps on interrupting Steve when he starts informing the viewers about a certain news report. It's just really become annoying to the point that I can't watch it anymore. Jillian is NOT a good journalist. Hell, she's more of a celebrity who loves being a celebrity. Hence, she instantly transforms into a celebrity around celebrities whom she's supposed to be interviewing. She's not very professional and quite possibly perceives her relationship with celebrities more important than being a rightfully insatiable journalist- and that's all I can say about her. 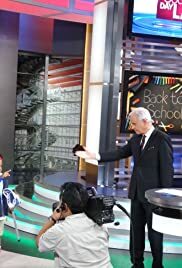 I believe "Good Day LA" is for young teenagers and celebrities, and it is definitely not for people who actually CARE about the news.